The Son who Steals from his Dead Father. As the crescendo of questions being asked about the latest scams perpetrated upon the Malays in particular and on all Malaysians in general, raises itself to deafening decibels…and I am talking about the grand theft of Felda’s Land right under the noses of those who have been given the task of protecting and managing the interest of the Malays in Felda (the so called Land Banks that would take Umno over the finishing line in PRU14), there is only deathly silence coming from Seri Perdana. 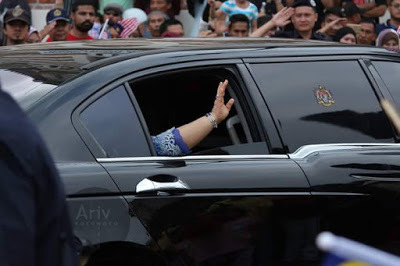 The sense of coming death for Najib, Rosmah, for Umno and BN over this latest audacious scam to feed the greed of the occupants of Seri Perdana and the many knaves in and around them, is palpable. 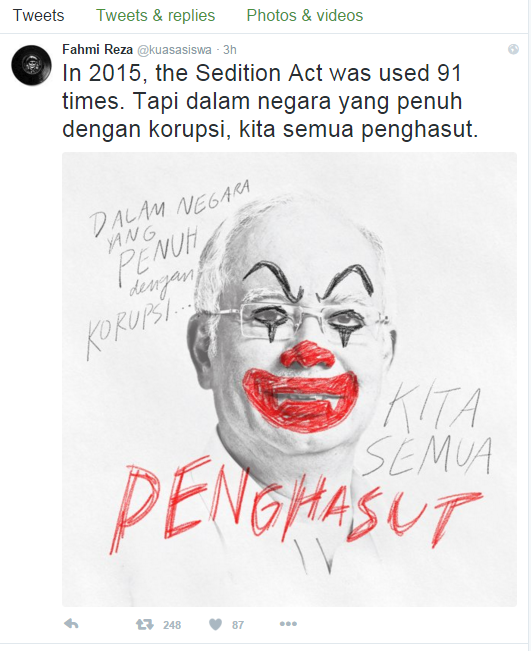 It hangs over Seri Perdana, over the Prime Minister’s Office and over Putrajaya and all the corrupt Umno and BN politicians that works there, like doom….like coming death. There is that sense that “ini kali” Najib Razak has crossed that line that makes what he has done in 1MDB and the many many other financial fraud he has perpetrated upon this nation of ours, simply a thing that can possibly be excused as the act of a man consumed by greed. With this grand theft of Felda’s Land, Najib Razak steals from his own father who is now dead. It was his father who breath life into Felda, his father who bequeath to Felda all that Felda needed to make it the largest Palm Oil producer in the world with all the financial tools and reserves it needed to remain one…and now all that is gone…..stolen by his eldest son, Najib Razak to enrich himself and his wife. Even those in Umno who have longed put up with the despicable greed of Rosmah and Najib in their unquenchable greed for money and yet more money…… even they are aghast at the audacity of him stealing from his dead father. What sort of a son would do such a despicable and dastardly deed? While those Najib has placed in Felda scrambled, like a headless chook in its death throes, to assure us all that Najib Razak was never an agent provocateur in this latest audacious scam to line his deep pockets with OUR money…..any fools can see that all roads lead to Mecca. None more so the roads within Felda that all lead to Najib Razak. That felon Isa Samad has served his purpose. Now we have Sharir Samad as Chairman of Felda. He too is put there by Najib Razak. What can Sharir do to absolve this son who steals from his father? Sharir will do what others before him has done. He will stand in front of us, as the IGP and AG has done, with hands on their hearts and intone “There is no evidence of fraud by Najib Razak. There is no criminal act committed. There is no intent by the Prime Minister to deceive the Malaysian public. Case closed”. Well may Sharir Samad say all that and more…but like the murder of Altantuya…the evidence is overwhelming. Like Altantuya, the evidence is compelling. Like Altantuya nothing can be done to hush things up after the fact because too many people are involved, too many dots can be joined to point out the perpetrators of the crime….. and like Altantuya, even the AG and the IGP can no longer cover up what has been done. This grand theft of Felda Land has been done, documented, signed sealed and delivered. All that is left for us to do is to join the dots to see from where the fouled deed originated, who schemed, plotted and managed its execution. And when the political will finally exists….who shall be punished for it. You and I know from where such duplicity and fraud has originated from. Today, in the times that we now live in, all roads lead to Seri Perdana. Enough said. By Hussein Abdul Hamid|2018-07-14T05:44:16+08:00December 29th, 2017|Categories: Uncategorized|Tags: Felda, Najib|Comments Off on The Son who Steals from his Dead Father.